It’s almost May – which means Spring is finally here (hopefully)! May Day marks a traditional Spring Festival in Germany celebrated with merriment, food, and of course – the iconic maypole / maibaum. One of the most traditional offerings at any German May Day Festivity is Maibowle – or May Wine – made with white wine infused with Sweet Woodruff syrup. Personally, I had never heard of Sweet Woodruff – it is a sweet, pleasantly-scented wild flower native to Europe – and it is called Waldmeister in German. Food.com has a recipe to make your own Maibowle, if you can get your hands on some Sweet Woodruff. Sweet Woodruff can also be used in a variety of desserts as a flavoring, and you can even buy Waldmeister syrup online. The Oma Way has a tasty-sounding recipe for Sweet Woodruff cheesecake, and Spoonfuls of Germany has a recipe for Waldmeister ice cream, for those of us with a sweet tooth. 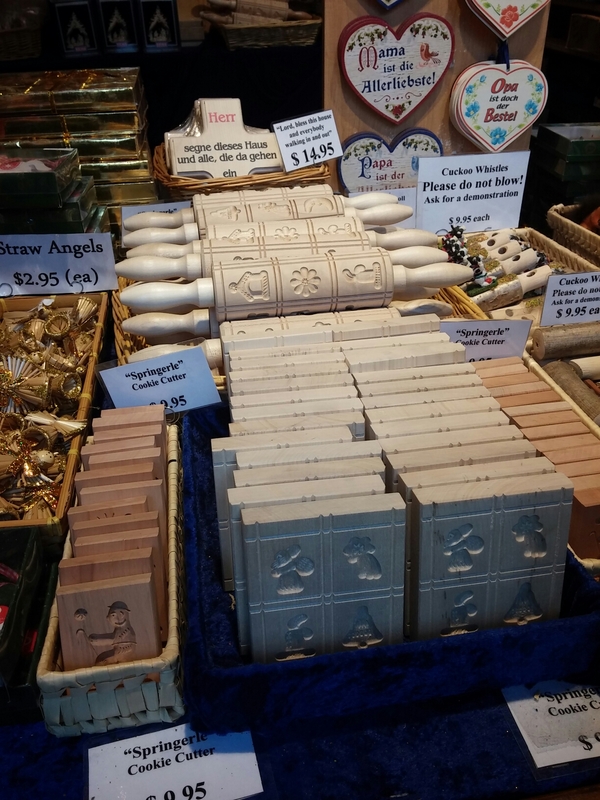 While at the Christkindlmarket in downtown Chicago we spotted these unique rolling pins and cookie molds amidst the wooden ornaments and whistles at a German handicrafts stand. Far from just being decorative, these “Springerle” pins and molds are used for imprinting designs on traditional German cookies of the same name. Springerle cookies are easy to make, and are basically sugar cookies flavored with anise, as in this recipe. However, traditional recipes call for a more unusual ingredient – baker’s ammonia. What makes these cookies really distinct are their festive designs, which may be stars, hearts, flowers, animals, people, or anything you might imagine. Springerle pins and molds have been common across Germany for centuries, and some of the antique designs truly are artful. 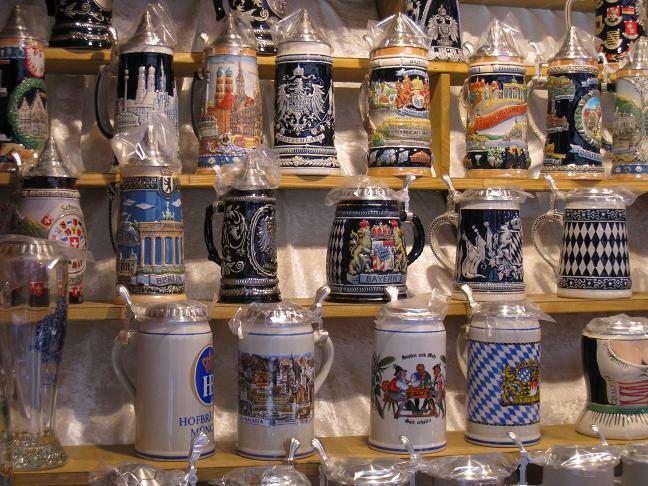 If you are not near a German market, you can buy a wide variety of springerle pins or molds online. It’s a rule – there is nothing we like more than baking treats for any associated holiday, American and international alike. St. Nicholas Day is coming up soon – December 6th, and in some European countries, it is a HUGE holiday complete with feasts, cookies, and having St. Nicholas fill your shoes with candy. One of the St. Nicholas Day treats that has traversed many borders and become something of a holiday staple is the German Pfeffernüsse cookie (which literally translates to “pepper nut”) which show up all around Central and Northern Europe this time of year. Similar cookies are called Pepernoden in the Netherlands and Pebernodder in Sweden. We even found a Swiss version of Pfeffernüsse in New Glarus, Wisconsin (see below). Pfeffernüsse are super easy to make and have a spiced, gingerbread-like flavor, sometimes coated in powdered sugar or glazed. The Austin Statesman has an interesting story about unearthing a heritage family Pfeffernüsse recipe and Saveur has a recipe that includes a rum glaze. We even saw a version at Trader Joe’s in the holiday special section, if you’re looking for an extra-quick treat. One of the traditional desserts for Rosh Hashanah is apples and honey, symbolic of sweetness for the coming year. Why not take it one step further with a tasty apple and honey cake popular across Central Europe, Versunkener Apfelkuchen, “sunken apple cake” in German. Smitten Kitchen has a recipe for sunken apple cake, with apples literally sunk into the batter, for a pretty showstopping presentation. 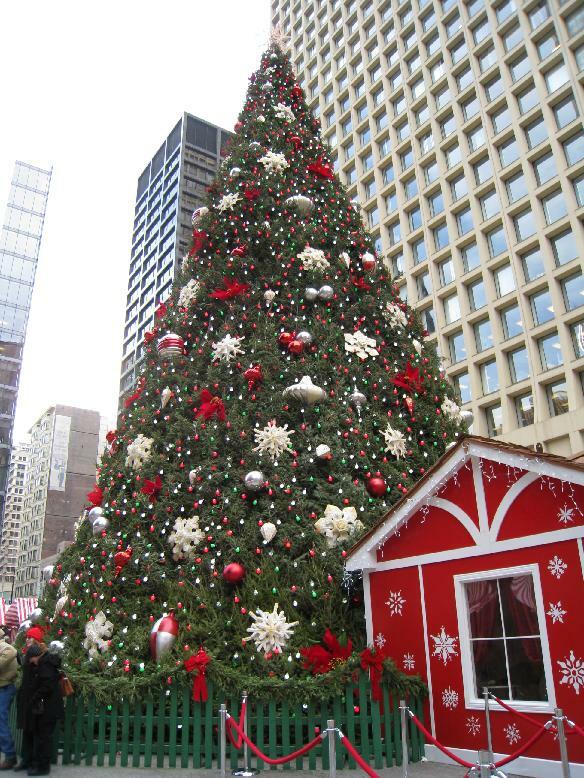 We were at Chicago’s venerable Christkindlmarket today, perusing the holiday ornaments while enjoying bretzels and roasted cashews, when we noticed a huge basket of glass ornaments shaped like pickles. “Odd,” we both said. But then we saw them at another booth, and again at another. What gives? We were intrigued. Finally, in one of the ornament shops, in the midst of yet-again vocalizing how confused we were by the pickle ornaments, a woman behind us jumped in: in her family, one person puts/hides the pickle ornament in the tree, and the person who finds the pickle ornament gets to open presents first, or gets an extra gift. And it was not just her family: apparently the Christmas pickle is a huge tradition! Though some people claim the pickle has German origins, it is probably actually an American or German-American tradition that took root in the late 19th century, just as glass ornaments were being popularized. Even though its origins are shrouded in mystery we like the idea that it is supposed to bring good luck! The first time we heard the word “Quark” our minds immediately went to the elementary particle and the publishing software (I guess we are a bit nerdy). However, much more appropriately to this blog, Quark can also refer to a type of fresh, un-aged cow’s milk cheese from Germany. While the name may not sound too appetizing, Quark is tasty and versatile, and can be used in any sweet or savory dish that calls for cream cheese or ricotta. Quark is popularly eaten in Germany for breakfast or as a snack (often with Nutella or fruit mix-ins). Popular recipes are quark kuchen/Käsekuchen, German cheesecake made with Quark, and Austrian Topfenstrudel. Though it has always been popular in Europe, Quark is experiencing something of a revival in the US. Vermont Creamery has a version of Quark, and Quark is now made in the Midwest, too. Quark has even been popping up on Chicago menus. Apparently one of the easiest cheeses to master, you can even make your own Quark. It is not a secret that we love Nutella. However, we are obviously not alone in our fandom of the Italian chocolate and hazelnut spread. The blog Pink Chocolate Break clued us into a new concept for the brand – 100% Nutella themed restaurants, called Nutelleria – now open in Bologna, Italy and Frankfurt, Germany. Perhaps unsurprisingly, typical fare at the Nutelleria includes Nutella-filled baguettes, croissants and crepes. Please Mind the Gap has a detailed report of a visit to the Nutelleria in Bologna. If only we had known to go there on our visit! Hopefully the Nutelleria concept will spread to other cities and maybe even other continents. We certainly think one would be welcome in Chicago. Though everyone is probably already overtired of holiday sweets, here is one more confection for the road (though is it really possible to be completely tired of sweets?) One of the most popular European Christmas treats is the German Stollen, a type of yeast-based fruit cake chock full of nuts, candied fruits and spices, and topped with powdered sugar. The history of Stollen is very complicated, and dates back to the 14th century, when it originated during a baking contest created by the Bishop of Nauruburg. Stollen enjoyed such an exalted place in German cuisine that a church ban on butter was lifted in the 16th century just to make the holiday cake (with some of the proceeds being used to build churches). Though Stollen is found throughout Germany and Europe, the most lauded variety is found in Dresden, a recipe that can be found here. Dresden even has an annual festival in honor of the cake. Due to our affinity of all things miniature, also check out this recipe for Mini Stollen. Spaghettieis: Ice Cream that looks like pasta? It’s going to be another hot day in Chicago (seems like we’ve been saying that nearly every day this month) so we figured it was time for another ice cream post. This one is a little more surreal than usual. 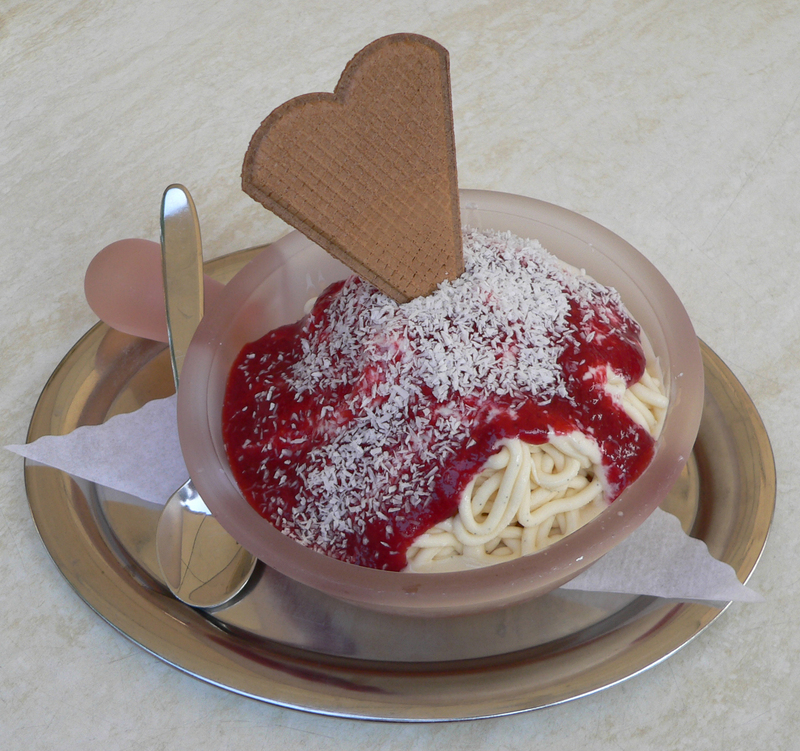 We saw a link on Boing Boing about Ice-cream that looks like spaghetti – spaghettieis. and we were thoroughly intrigued. Apparently this confusing German treat is composed of vanilla ice cream extruded through a Spaetzle Press/Pasta Extruder/Play-dough mold to look like spaghetti. To complete the spaghetti-dinner look, the ice cream is topped with some sort of red berry sauce, and finally covered in coconut shavings. Since its invention in the 1960s, spaghettieis has become something of a national dish in Germany. For more proof of its popularity, check out the huge amount of spaghettieis documentation of Flickr. We’re pretty impressed at the verisimilitude! One of our friends is a big proponent of German cuisine. While the Eaters have never been huge fans, we are always open to having our minds changed. One of the major problems we’ve encountered is that many German restaurants in America seems pretty stodgy and old fashioned. So it interested us to learn that German food (in Germany, at least) is undergoing a sort of renaissance. The New York Times has the details about the new wave of Teutonic cuisine. A revelation! Somewhere to eat in the loop for lunch or after work. That is – somewhere that isn’t Dunkin’ Donuts or Starbucks. You can find this little, 4-seater organic cafe on the corner of Washington and Wells, next to Corner Bakery. The specialty is the Bretzel, the proper German appellation of “pretzel”, which you can get with nutella, preserves or cream cheese. Alongside this eponymous specialty, HB makes a mean gourmet sandwich (Turkey, gruyere, and many more). For a snack or pick-me-up, the store is also jam-packed with a selection of coffee/tea drinks and a mind-blowing assortment of international organic chocolates. In fact there is an entire wall of chocolates for the choosing. HB claims to be the only organic restaurant in the loop. No preservatives, no splenda, and no american cheese (praise!). Even the drink cups are made from a biodegradable corn material. All in all, we are in love with HB, and we recommend all of our Chicago friends check it out. The grub is great, the price is right, and you won’t be supporting the chain-restaurant regime. Plus, it sure as hell beats Auntie Anne’s. A HB location recently opened at 233 N Michigan Avenue. A vegetarian restaurant in the heart of a country known for its obsession with meat products typically wouldn’t have been our first choice. But after an adventurous day in Munich, the eaters decided to give this highly-recommended establishment a try. The minimalist, upscale central room with all white walls was an inviting contrast to the overcast day outside, and the food definitely completed the experience. The menu was international fare, ranging from East Asian sitr-frys and Indian lassis, to pizzas and crepes. We felt like going Italian on this day, ordering two of Prinz Myshkin’s pasta dishes. The tagliatelle tartufa, with truffels, marscapone, and cream was rich and flavorful without the gut-busting portions typical of many American restaurants. The tagliatelle amanda, with tomato cream, hazelnuts, and oyster mushrooms was so well balanced and subtly flavored that it actually made Eater 1 reconsider his dislike of mushrooms altogether. After the main course, we ordered a small pot of tea to bring the meal to a close. As we sipped, we discussed the polite but never pushy service, the chic but not overwhelming decor, and the food that consisted of what was easily our finest meal in Germany.